Dr. Laxmi Ramasubramanian, Architect and City Planner. 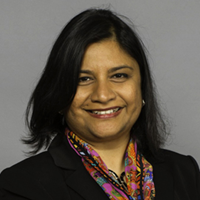 Laxmi is an Associate Professor of Urban Planning and Policy at Hunter College and Deputy Director at the Institute for Sustainable Cities at Hunter College. She holds undergraduate and master’s degrees in Architecture from the University of Madras, India, a master’s degree in city planning from the Massachusetts Institute of Technology and a Ph.D. in Architecture from the University of Wisconsin-Milwaukee. She is also a certified planner holding the AICP credential. Dr. Ramasubramanian seeks to inform and transform planning practice to create a just and equitable society. Specifically, her research examines how the use of digital technologies such as GIS can alter social and political processes, particularly the power of individuals and institutions to create and sustain social change. Her research is synthesized in her first book Geographic Information Science and Public Participation (Springer, 2010). Dr. Ramasubramanian’s second book, Essential Methods for Planning Practitioners: Skills and Techniques for Data Analysis, Visualization, and Communication, co-authored with Professor Jochen Albrecht (Springer, 2018) bridges theory and practice by framing 21st-century planning practices within their socio-political and ethical context. Dr. Ramasubramanian has been recognized as a leader in the geospatial community. She served as the elected president of theUniversity Consortium for Geographic Information Science (2012-2014). In February 2016, she was appointed to a three-year term on the National Geospatial Advisory Committee, a federal advisory committee that provides guidance to the federal government on matters of national geospatial policy. Dr. Ramasubramanian maintains an active research program with funding from a range of public and nonprofit sources. Currently, she serves as Co-Principal Investigator on a grant funded by the National Science Foundation to develop mentoring workshops and other supportive strategies to empower women in the geospatial sciences.